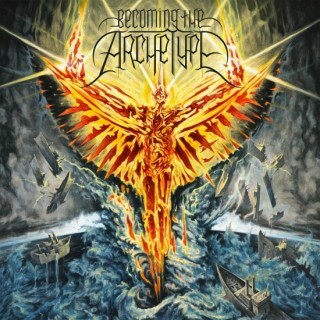 Becoming the Archetype is one of the tightest, most talented bands I've ever heard and/or seen live. The guys are super down-to-earth and are really personable towards critics and fans alike. I got into this band because of their previous release, Dichotomy, which is still one of the best albums I've ever heard. This album, Celestial Completion, while it is no Dichotomy, is still a more than solid release and a very, very satisfying listen. The sound is likely to throw off some of the "purist" metal fans who believe their original sound was best. However, no one can deny the talent these guys have. While some of the guitar solos aren't entirely "ground-breaking" or original, the breakdowns and vocals are classic BTA. Some fans were jumping ship when "The Magnetic Sky" and "Cardiac Rebellion" were previewed to the public. However, the band assured them that "no two songs sound the same", and this is very true. Each song has a unique sound and it fits for such a unique band. The album opens with a chant-like song filled with operatic vocals and medieval-esque singers. I thought this was awesome since these guys actually wrote the lines to all 4 parts. From there, it transitions to "The Magnetic Sky", which is also the first single from the album. This song has a chorus which caused a lot of criticism at first, but grew to be a staple of live sets. Daniel and Seth have complementing singing voices AND Jason/Daniel have awesome contrast to their screams as well. Adding Dan to the band was a great choice. "Requiem Aeternam" is a 3-part track akin to Terminate Damnation's "Elegy" since it has multiple "parts" and each part sounds totally different than the last. The songs show off Seth's piano skills, Jason's epic screams, and the band's overall vision. This is the most technical song on this album. I am almost required to mention that the final part begins with an absolutely awe-inspiring display of Wisdom's vocal growls. The rest of the album is kind of a free-for-all, but at the same time it has a flow. Each song could easily stand on its own as a single, but somehow they also work together in harmony. Like I said before, it isn't Dichotomy, but it's definitely the second best out of their catalog. Don't believe the bad reviews from metal purists. Listen for yourself and you won't be disappointed. Becoming the Archetype's previous album "Dichotomy" is one of my favorite albums and was my #2 for 2008, so they had a lot to live up to with "Celestial Completion." The thing about BTA is that they are ridiculously heavy and technical compared to most Christian metal bands. If you've never heard them, you have to pay close attention to the lyrics to realize they are Christian lyrics because the vocals are regularly intense growls with some clean thrown in here and there. Still not convinced? How about their rendition of "How Great Thou Art" to prove it. Anyway, onto this album, I don't think it's as heavy on the whole as "Dichotomy" was but it sure isn't soft or lackluster either. The technicality of the guitar work is too astonishing to be called a metal core album and they break the metal core tag when they fuse in a piano and trumpets. Tracks 2 , 6, 7, 9, & 11 are all great tracks. Track 8 really didn't need to be a separate track at all even for an interlude or intro to track 9. It was pointless. The lyrics are intelligent and of course are full of religious context but it doesn't take away for those that are not Christian. The album features tempo changes and seamless transitions and even some lengthy tracks to keep the listener's attention. If you've not heard BTA, listen to this album, and then go on to "Dichotomy" and you'll be hooked. A somewhat lukewarm discovery on my part, Becoming The Archetype is one of those bands that is obviously filled to the brim with playing talent, but never seems completely confident enough to find their own ground. My first experience with this American progressive metalcore band, 'Celestial Completion' is certainly the work of talented instrumentalists, and while there are some incredible moments to delve into here for a progressive metal fan, the album is sorely brought down by a general lack of consistency. Although 'Celestial Completion' is rife with promise in parts, the listener should be prepared to wade through some rhinestones along the way. With an opening segment that instantly recalls the vocal acrobatics of Symphony X, Becoming The Archetype solidify their place as one of the new prog metal bands attempting to relive the glory of the old giants. While this may give only the more negative connotations imaginable, it should be noted that for what they do, Becoming The Archetype do it quite well. Dark and heavy guitar riffs are coupled with the atmospherics of keyboard work and some very good drum work courtesy of the percussionist Nook. This may sound endearing for a fan of progressive metal, but the way it is all put together is incredibly hit-or-miss. More often than not, the band will go from a great moment of technicality to a sickening deathcore moment, or ridiculously cheesy synth section. Were the album comprised only of the cheesy symphonic metal and deathcore in alternating sequence, 'Celestial Completion' would not be worth a single listen in my eyes. Becoming The Archetype become tricky to review in the sense though that in between these sections of ridicule, there are some very cool things going on. 'Invisible Creature' is a fine example of the sort of interesting things Becoming The Archetype manage to hide in the album, a short but effective raga interlude that segues seamlessly into 'Cardiac Rebellion'. Most of the time however, the great parts of the music are hidden within songs, be it a promising piano breakdown, jazz section or exciting prog riff. Becoming The Archetype shows themselves off as being full of potential here, but it is a moot point if they let themselves get bogged down by their weak elements.